New season of Littleport Society meetings announced. I’ve just received the latest edition of The Littleport Society magazine, so thought i’d share the event info with you that covers the next few months. I’ve been a member of the society for years now and they are exceptionally helpful. 1st June: Gerald Siviour – East Anglia Railways – the last 50 years. All meetings are held on the first Tuesday of each month (except for August when there are no meetings) at 7.30pm at the Village Hall, Victoria Street, Littleport, Cambridgeshire. Non-members are welcome. Please note that events/talks are subject to change. Author Andrew MartinPosted on June 27, 2009 Categories Cambridgeshire, Fenland, Littleport, RailwaymenTags Addenbrookes, Alan Litshel, Bill Wittering, bottles, eels, fens, Gerald Siviour, Gordon Easton, Hilary Ritchie, history, huguenot, Iain Harvey, Littleport, Littleport Society, Malcolm Gaskill, meetings, Mike Petty, nursing, Peter Carter, railways, Royal Mail, St George's Church, talks, Tessa West, Victoria Street, witchesLeave a comment on New season of Littleport Society meetings announced. James Martin (1851-1934), originally uploaded by familytreeuk. The December issue of the BBC’s ‘Who Do You Think You Are?’ magazine features my photograph in their ‘Over To You’ section (page 36). I’m pleased to see it in print – it’s such an interesting/amusing photograph – showing a real mixture of characters. 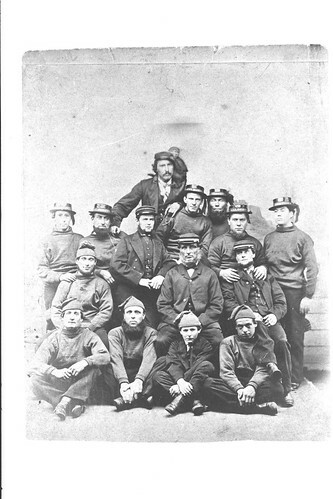 There appears to be four railwaymen (like my Great Great Grandfather, James Martin who appears at the top of the photo with the monkey on his shoulders), but also some sailors too (their hats read ‘Albert’). I think that the photo was taken in 1887. My reasons for this are that this was the year of the Queen’s Golden Jubilee (hence ‘Albert’ on the hats) and the jumpers of the ‘sailors’ appear to have “RTYC” (Royal Thames Yacht Club?) embroidered on them and they raced in 1887….. I also think that my Gt Gt Grandfather looks like he’s in his thirties. I’m amused by the ‘dwarves/smurfs’ at the front of the photo and also of the very scary looking ‘black beard’ pirate character lurking towards the back. Who were they? What was going on? When was this? Where was it taken? Hopefully the magazine will throw up some answers in the show’s web forums.